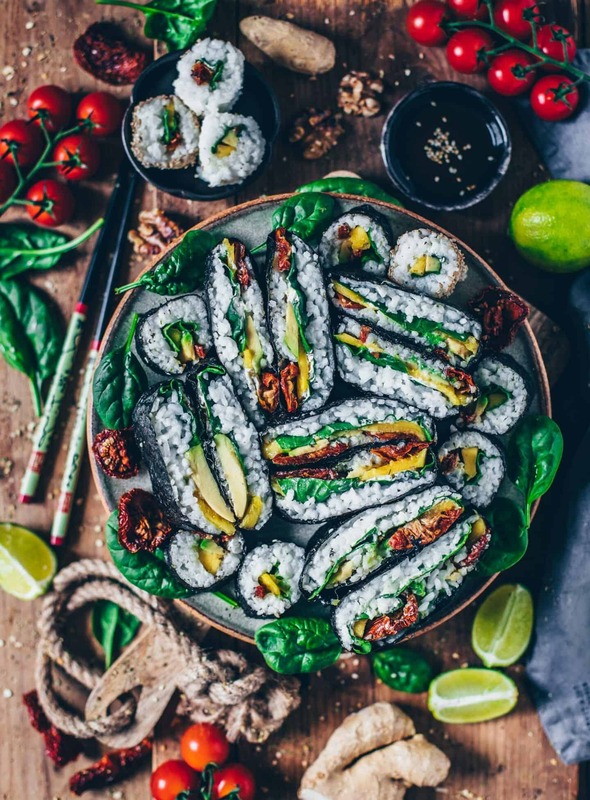 Vegan sushi made from plant-based ingredients. This recipe is gluten-free, healthy, delicious and you can make it in many different ways. 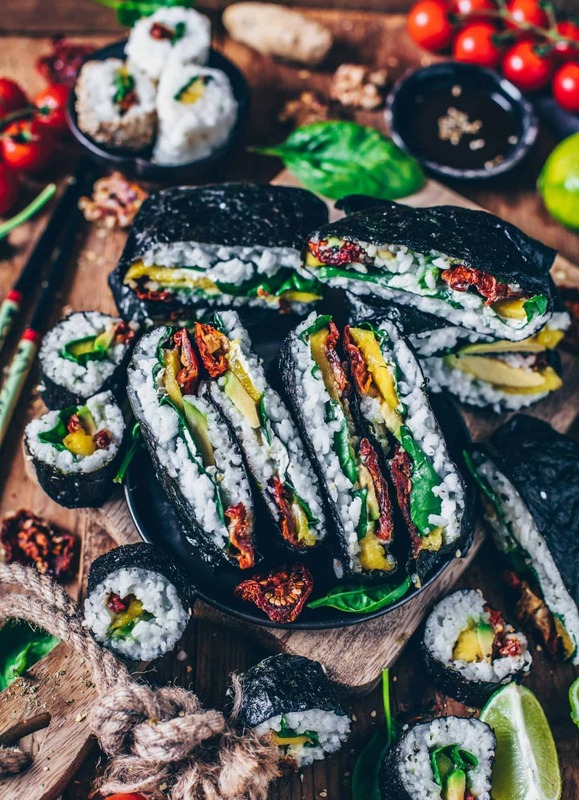 The sushi sandwiches (Onigirazu) are also great as a grab and go snack. 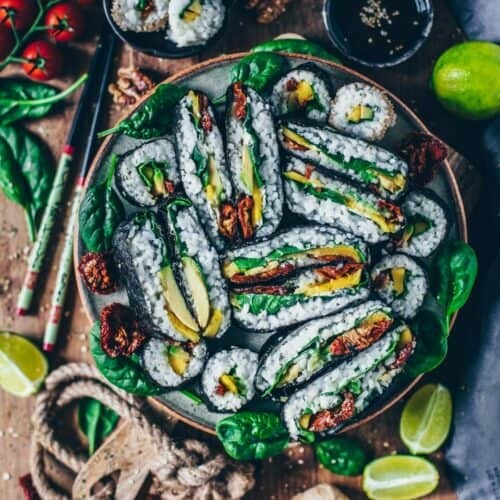 Are you vegan and do you like sushi? Then I have a perfect recipe for you today. 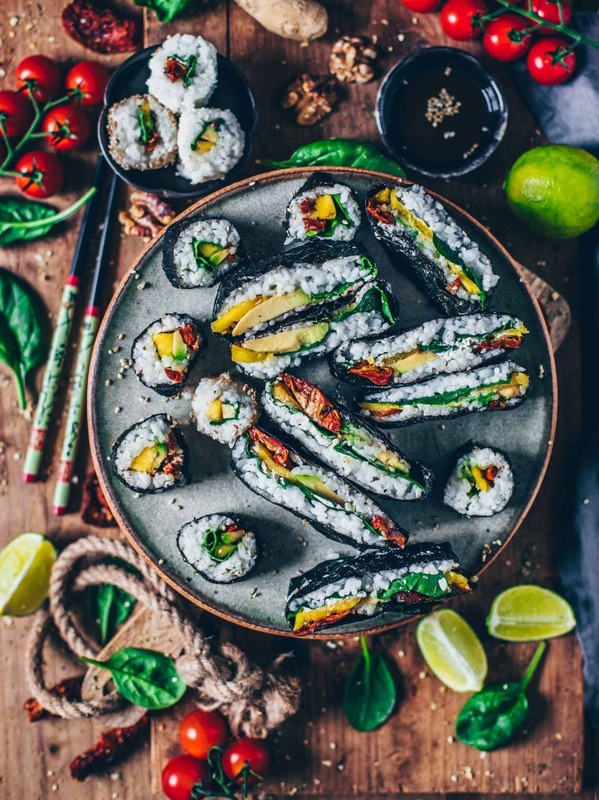 This sushi recipe is vegan, gluten-free, made only from plant-based ingredients and incredibly delicious. It’s also very healthy, rich in nutrients and not as complicated as you might think. 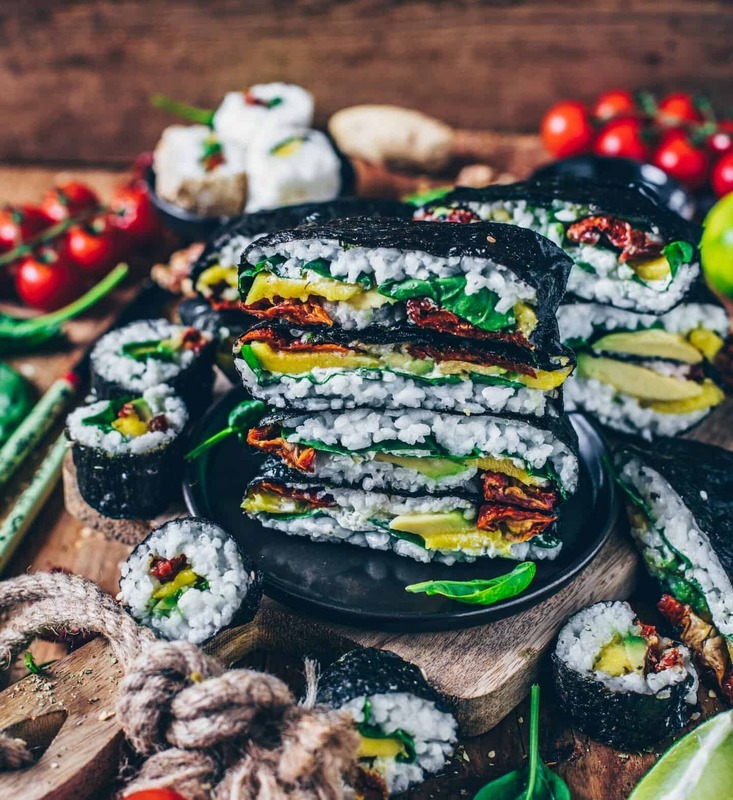 You can choose for yourself whether you prefer to fold sushi sandwiches (Onigirazu), or if you prefer making the classic sushi rolls (Maki). If the decision is too hard for you, then you can simply make both! ? Since the weather is getting warmer, I mostly prefer a lot more fresh meals, such as colorful salads with a filling garnish. And because I felt like making sushi, I thought it would be also a suitable opportunity to share the recipe with you. As you know, I love variety on my plate. So I also made some sushi sandwiches (onigirazu) in addition to the classic sushi rolls (maki) from the same ingredients. They are prepared even faster and are also really practical to take with you. Because we wanted to go on a trip, these sandwiches were just perfect. I simply wrapped them in bread paper and took them closed in a lunch box. My friends were thrilled and I think it’s really a great alternative to traditional sandwiches with toast or bread. 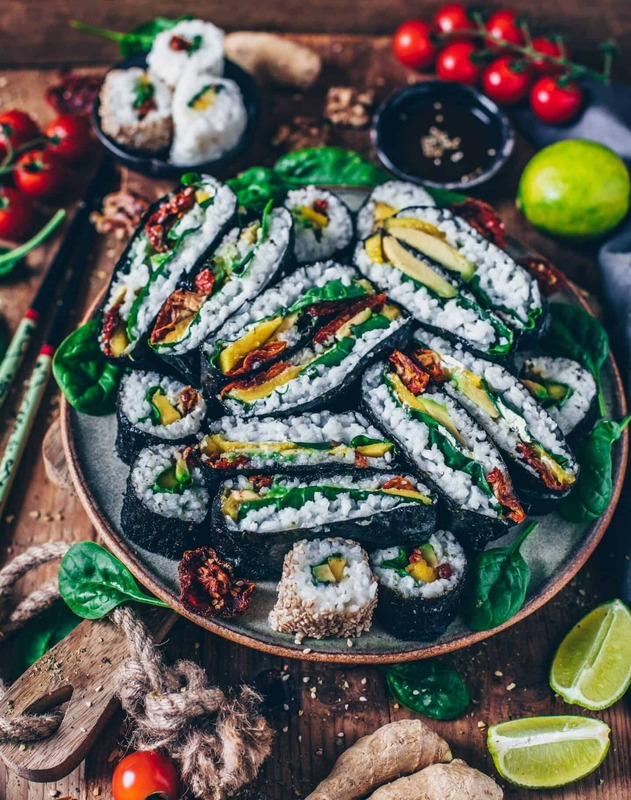 Vegan sushi is actually just cooked sushi rice with rice vinegar, plus a filling of your choice, wrapped in a thin nori algae leaf. For the filling you can, of course, take any vegetables and fruits of choice as well as cream or spread at will. Depending on what you like. Anyway, today I have chosen a filling which I tried in a vegan restaurant a while ago: fruity sweet mango with creamy avocado, fresh spinach and dried tomatoes. Together with roasted walnuts and vegan herbal cream cheese, I think it just tastes amazing. If you are allergic to walnuts (or you don’t like them), you can, of course, also take another nut variety. Optionally, roasted pine nuts or sunflower seeds are a great alternative. However, I would not give up completely on roasted nuts or seeds, because they not only provide the extra “crunch”, but also an indispensable taste-rich nutty flavor. Just let your creativity or your taste run wild and try out different ingredients to find out which combinations you like most. ? Now let’s finally come to the recipe! 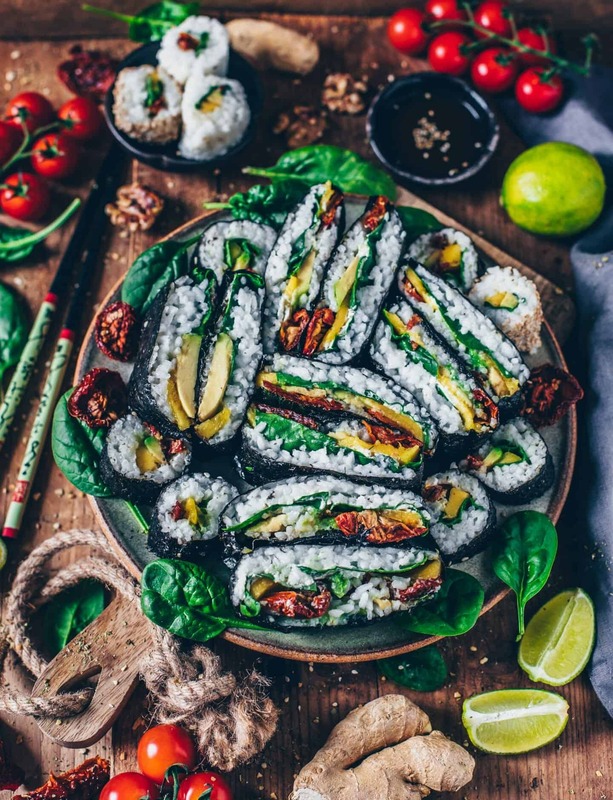 If you try it, then I‘d love to know, what are your favorite ingredients for vegan sushi. You are also welcome to post a picture on Instagram and link it to @biancazapatka so that I can see your amazing creations. ? First cook the sushi rice in a saucepan according to the instructions. Then reduce the heat to low level and cook covered for about 10-15 minutes. Then remove the pot from the heat and let the rice evaporate for about 5 minutes without lid. Then fill in a large bowl, spread a little and let cool. Mix the rice vinegar, sugar (agave syrup) and salt in a small saucepan and bring to a boil until the sugar and salt have dissolved. Then allow to cool and fold in the rice. Wash and drain the spinach. Halve the avocado, remove the core, spoon out the pulp with a spoon and slice. Season with a bit of salt and pepper, if you like. Peel the mango, cut the pulp around the core and cut into slices. Cut dried tomatoes into small pieces. Roast walnuts briefly in a pan without oil. Place a nori sheet on a piece of cling film. Approximately place 1-2 tablespoons of rice centered on the nori leaf and press gently. Then cover with the toppings of your choice (cream cheese, spinach, avocado, mango, tomatoes and walnuts). Finally spread another layer of rice. Then fold the corners carefully to the center and press with damp fingers slightly on each other. Turn the sushi sandwich over, shape it and leave it for a few minutes before cutting. 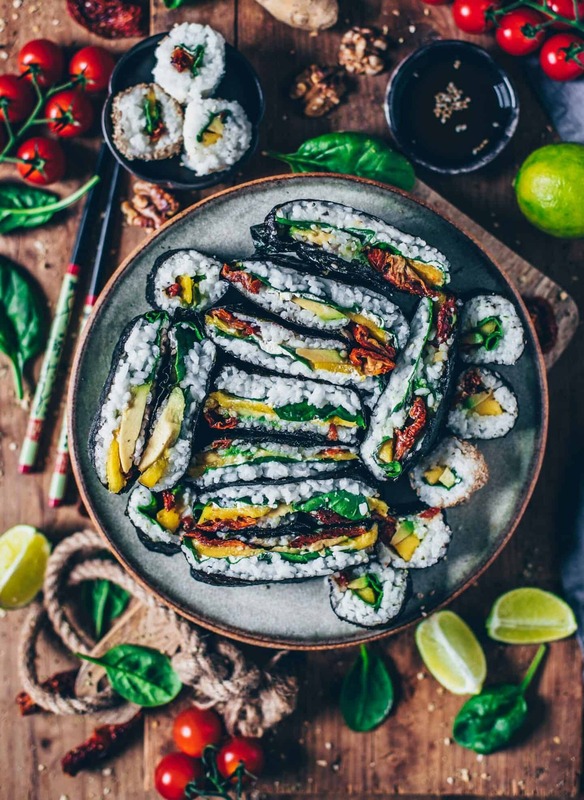 Wrap a sushi mat with cling film and place a nori sheet on top. Spread the rice evenly over it, leaving about 1-2 cm at the top and bottom. Then spread the toppings of your choice on top (cream cheese, spinach, avocado, mango, tomatoes and walnuts). Now roll everything together with the sushi mat, applying some pressure as you go. Finally, cut the roll into equal pieces. You can also prepare the rice one day before. Instead of walnuts, you can also use another nut variety. Optionally, roasted pine nuts or sunflower seeds are a great alternative. The sandwiches can be stored in the fridge for one day, but they taste fresh best. You can also wrap them in cling foil or in parchment paper placed in a lunch box as a snack to take away. IF YOU HAVE YOUR PINTEREST, YOU CAN FIND HERE AND POST YOUR FAVORITE PICTURE, IF YOU LIKE!